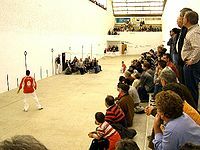 The Valencian Community[a][b] is an autonomous community of Spain. It is the fourth most populous autonomous community after Andalusia, Catalonia and Madrid with more than 4.9 million inhabitants. Its homonymous capital Valencia is the third largest city and metropolitan area in Spain. It is located along the Mediterranean coast on the east side of the Iberian peninsula. It borders with Catalonia to the north, Aragon and Castilla–La Mancha to the west, and Murcia to the south. The Valencian Community consists of three provinces which are Castellón, Valencia and Alicante. Many Valencian people speak Valencian, the region's own co-official language, a southwestern dialect of Catalan standardised by the Acadèmia Valenciana de la Llengua. Valencian is a diglossic language that was repressed during Franco's dictatorship in favour of Spanish. Since it regained official status in 1982 in the Valencian Estatut d'Autonomia. Valencian has been implemented in public administration and the education system, apparently leading to an exponential increase in knowledge of its formal standard. Valencian is understood by more than half of the population living within the Valencian Community. Valencia was founded by the Romans under the name of "Valentia Edetanorum", which translates to 'Valiance (or Courage) of the Land of the Lamb'. With the establishment of the Taifa of Valencia, the name developed to بلنسية‎ (Balansīyah), which eventually became Valencia after the expulsion of the Moors. "Valencian Community" is a neologism that was specifically adopted after democratic transition in order to solve the conflict between two competing names: "Valencian Country" and "Former Kingdom of Valencia". [b] On one hand, "Valencian Country" represented the modern conception of nationality that resurged in the 19th century. It became well-established during the Second Spanish Republic and later on with the works of Joan Fuster in the 1960s, implying the existence of the "Catalan Countries" (Països Catalans). This nationalist subtext was opposed by anti-Catalan blaverists, who proposed "Former Kingdom of Valencia" (Antic Regne de València) instead in order to emphasize Valencian independence from Catalonia. Currently, blaverists have accepted the official denomination. Archeological site of Tossal de Manises, ancient Iberian–Greek–Carthaginian–Roman city of Akra Leuke or Lucentum, Alicante. The Pre-Roman autochthonous people of the Valencian Community were the Iberians, who were divided in several groups (the Contestani, the Edetani, the Ilercavones and the Bastetani). The Greeks established colonies in the coastal towns of Saguntum and Dénia beginning in the 5th century BC, where they traded and mixed with the local Iberian populations. After the end of the First Punic War between Carthage and Rome in 241 BC, which established their limits of influence in the Ebro river, the Carthaginians occupied the whole region. The dispute over the hegemony of Saguntum, a Hellenized Iberian coastal city with diplomatic contacts with Rome, destroyed by Hannibal in 219 BC, ignited the Second Punic War, which ended with the incorporation of the region to the Roman Empire. The Romans founded the city of Valentia in 138 BC, which, over the centuries overtook Saguntum in importance. After the Fall of the Western Roman Empire, during the Barbarian Invasions in the 5th century AD, the region was first invaded by the Alans and finally ruled by the Visigoths, until the arrival of the Arabs in 711, which left a broad impact in the region, still visible in today's Valencian landscape and culture. After the fall of the Caliphate of Cordoba, two main independent taifas were established at the region, Balansiya and Dénia, along with the small and short living taifas of Orihuela, Alpuente, Jérica and Sagunt and the short Christian conquest of Valencia by El Cid. 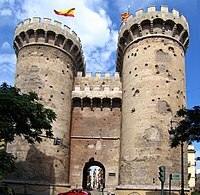 However, the origins of present-day Valencia date back to the Kingdom of Valencia, which came into existence in the 13th century. James I of Aragon led the Christian conquest and colonization of the existing Islamic taifas with Aragonese and Catalan colonizers in 1208; they founded the Kingdom of Valencia as a third independent country within the Crown of Aragon in 1238. The kingdom developed intensively in the 14th and 15th centuries, which are considered the Golden Age of the Valencian Culture, with significant works like the chivalric romance of Tirant lo Blanch. 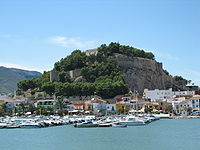 Valencia developed into an important kingdom in Europe economically through the silk trade. It also rose to power politically with the rise of the Crown of Aragon, (within which the Kingdom of Valencia had achieved the largest population and the greatest economic power at that time) and the ascension of the Valencian House of Borja in Rome. After a slow decline following the dynastic union of the Crown of Aragon with the Kingdom of Castile, Valencia's successful status came to a definite end with the Expulsion of the Moriscos in 1609 by the Hispanic Monarchy, which represented the loss of up to one third of the population of the Kingdom of Valencia and took the main agricultural labor force away. The first attempt to gain self-government, or autonomous government, for the Valencian Country in modern-day Spain was during the Second Spanish Republic, in 1936, but the Civil War broke out and the autonomist project was suspended. 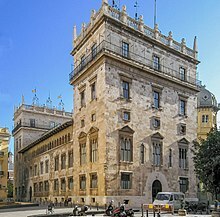 In 1977, after Franco's dictatorship Valencia started to be partially autonomous with the creation of the Council of the Valencian Country (Consell del País Valencià), and in 1982 the self-government was finally extended into a Statute of Autonomy (Estatut d'Autonomia) creating several self-government institutions under the Generalitat Valenciana. The first democratically elected President of the Generalitat Valenciana, Joan Lerma, took office in 1982 as part of the transition to autonomy. The Valencian Statute of Autonomy make clear that Valencia is intended to be the modern conception of self-government of the Valencian Country from the first autonomist movements during Second Spanish Republic, but also joining it to the traditional conception of Valencian identity, as being the successor to the historical Kingdom of Valencia. [b] In fact, after a bipartisan reform of the Valencian Statute of Autonomy in 2006, it records the foral civil law, using the traditional conception of a kingdom, and, on the other hand, it also recognizes Valencia as a nationality, in accordance with the modern conception. Hot semi-arid climate (Köppen BSh), although in zones at the interior the average temperatures are slightly lower, being BSh in the Köppen climate classification. It roughly goes along the coastal plain from Villajoyosa through the southernmost border of the territory (cities included here are, amongst others, Alicante, Benidorm, Elche, Orihuela and Torrevieja). Summers are hot and dry, winters are mild and its most prominent feature is a very scarce precipitation, typically below 300 mm. per year which is most likely to happen during spring and autumn. The reason for this lack of precipitation is the marked rain shadow effect caused by hills to the west of the Alicante province (and, to a lesser degree, those in the northern part of the province which, in turn, enhance the inverse orographic lift effect around Cap de la Nau). There are only two major rivers: the Segura in the Province of Alicante, whose source is in Andalusia, and the Júcar (Xúquer) in Province of Valencia, whose source is in Castilla–La Mancha. Both are subjected to very intense human regulation for cities, industries and, especially, agricultural consumption. The river Turia (Túria) is the third largest and has its source in Aragon. Most rivers in the area, such as the Vinalopó, are usually short, have little current (due to agricultural usage, climatic reasons or both) and are often completely dry during the summer. Other Valencian rivers are the Serpis and Sénia. In the process whereby democracy was restored in Spain between 1975 and 1978, the nationalist and regionalist parties pressed to grant home rule to certain territories in Spain. The constitution of 1978 opened a legal way for autonomous communities to be formed from provinces with common historical and cultural links. In recognition of the Valencian Country as a nationality of Spain, and in accordance to the second article of the Spanish Constitution which grants autonomy to the "nationalities and regions" that compose the Spanish nation, Valencia was granted self-government and constituted itself as an autonomous community in 1982, with the promulgation of its first Statute of Autonomy, the basic organic law, later approved by the General Courts of Spain. Hydrological resources (see Geography above) are also lacking: the demand for water exceeds the supply, with this imbalance especially serious in Alicante province. In particularly severe drought years, the problem is managed through occasional nocturnal restrictions during summer and exploitation of aquifers. 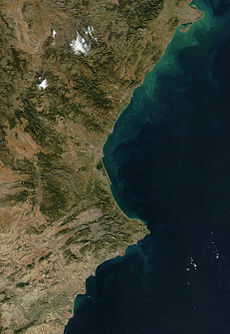 Valencia's water needs result in harsh contention with neighbouring regions such as Castilla–La Mancha and Catalonia. The unemployment rate stood at 18.2% in 2017 and was higher than the national average. Not all of the Valencian territory is historically Valencian-speaking, with 10% of the population, 500,000, living in traditionally Spanish-speaking inner regions. Also large numbers of foreign immigrants since 2000 become Spanish speakers. These regions include the areas where Aragonese rather than Catalan settlers introduced Castilian-Aragonese language in the historic Kingdom of Valencia, as well as several Castilian municipalities that were annexed to the Valencian Community in the 19th century. Valencian is traditionally spoken in the more densely populated coastal areas where Catalan settlers introduced their language in the Middle Ages. These areas are delimited for administrative purposes by the Generalitat, that established different areas of linguistic predominance (predomini lingüístic). The Valencian area of linguistic predominance suffers in many cases a process of linguistic substitution, especially in the cities of Valencia and Alicante, with populations of 1 million together where Spanish has become predominant in spite of Valencian being the traditional language. Outside these areas and the traditional Spanish-speaking areas in the west Valencian predominates or is on an equal footing. Despite differences in dialect and denomination, linguists consider Catalan and Valencian two varieties of the same language. They feature relative uniformity in terms of vocabulary, semantics, syntax, morphology and phonology. Mutual intelligibility ranges from 90 to 95%, which is considerably higher than between dialects of an assumed single German language (High German). 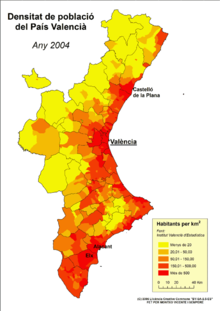 Furthermore, there is a dialect continuum where speakers at the Catalan–Valencian border share the same dialect. In practice, Catalan and Valencian share the same written standard, as established by the AVL and the Institut d'Estudis Catalans respectively. Much of the bibliography used in the Valencian education system consists of Catalan works and translations in Catalan with only occasionally some words being swapped for those more commonly used in Valencia. Furthermore, the Universities of Valencia and Alicante refer to Valencian studies of language and literature as Catalan Philology. In spite of these arguments, a significant proportion of Valencian population refuse to identify Valencian with Catalan. This phenomenon is known as blaverism. This position is often held by those who use Castilian more commonly than Valencian or do not use the latter fluently as well as promote Spanish nationalism and oppose Catalan independence. The government of the PP has been criticized for publicly endorsing some of these positions. However, younger generations educated in Valencian are much less likely to hold these views. 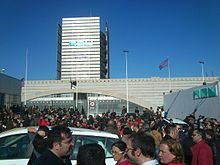 Employees demonstrate in front of the RTVV headquarters in Burjassot the day of its closure. The great majority of desserts typical of Valencia have their origin in Arabic times and play an important part in the local festive activities. Some are internationally famous. Xixona is the place of traditional manufacture of turrón, torró in Valencian (a soft nougat), consumed during Christmas in Spain and the rest of the Hispanic world. In Casinos the turrón is typical too but the most important manufacture of the village is peladillas (dragées and sugared almonds). In Xàtiva, the arnadí, a dessert elaborated with pumpkin is made. 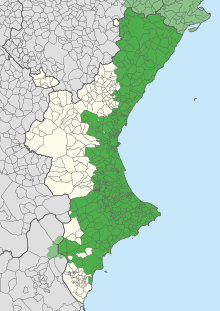 Orihuela and its region have the almojábanas. The official Valencian anthem is the Hymn of the Regional Exhibition of 1909 (Himne de l'Exposició Regional de 1909 in Valencian; commonly known as the Himne de Valencia, "Anthem of Valencia"), in whose composition the old hymn of the City of Valencia of the 16th century is included. The emblem of the Valencian Generalitat (coat of arms) includes the heraldry of King Peter IV of Aragon, representative of the historical Kingdom of Valencia, whose shield is inclined towards the right, or, four bars Gules. 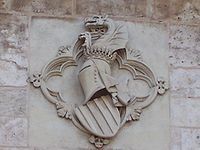 Other symbols are used at different levels by the Valencian society, like the heraldic animals of rat-penat (a bat) and drac alat (a winged dragon which was the emblem of James I). One of the most recognised and representative valencian symbols are the music and dance of the Muixeranga, ancient tradition of human towers preserved for the last 4 centuries, during the Festivity of 'La Mare de Déu de la Salut Festival' of Algemesí, recognized-UNESCO "intangible heritage of humanity". Typical folk music in celebrations is played with the tabalet (a drum) and the dolçaina (a flute). Valencian traditional costumes and dresses include espardenyes (shoes) and traditional fallera dresses (the Falles dresses). Football (association football) is the most widely known sport. There are teams in every town or village, four of which are currently playing in La Liga, Spain's premier league: Valencia CF, Villarreal CF, Elche CF and Levante UD. There are many big teams elsewhere, such as CD Alcoyano, Hércules CF, and CD Castellón. Professional Basketball is represented by one team, Valencia Basket in the top league, the Liga ACB. Also, Ros Casares Valencia is a female basketball team, which is the current champion of the Spanish Women's League and finalist of the EuroLeague Women. ^ a b c Preamble on Valencian Statutes of Autonomy 1982 and 2006: "Aprovada la Constitució Espanyola, va ser, en el seu marc, on la tradició valenciana provinent de l'històric Regne de València es va trobar amb la concepció moderna del País Valencià i va donar origen a l'autonomia valenciana [...]"
^ a b "El País Valencià perd habitants per primera vegada des de 1996". La Veu del País Valencià. March 2013. Retrieved 9 April 2015. ^ a b "Estatut d'Autonomia". Corts Valencianes. 1982. Archived from the original on 3 October 2018. Retrieved 9 April 2015. ^ a b Generalitat Valenciana (April 10, 2006). "LEY ORGÁNICA 1/2006, de 10 de abril, de Reforma de la Ley Orgánica 5/1982, de 1 de julio, de Estatuto de Autonomía de la Comunidad Valenciana" (pdf). DOCV. Retrieved February 17, 2013. ^ "Valenciano". Diccionario de la lengua española. Real Academia Española. October 2014. Retrieved 9 April 2015. ^ "La població que sap escriure en català es quintuplica en els últims 25 anys". Conselleria d'Educació, Cultura i Esport. November 2014. Retrieved 9 April 2015. ^ "Third Section, First Chapter of the Statute of Autonomy of the Valencian Community". Archived from the original on 2007-12-26. Retrieved 2007-12-14. ^ "Eurostat GDP figures 2004" (PDF). Archived from the original (PDF) on 2009-03-26. Retrieved 2012-11-17. ^ "Cens 2011. Dades generals coneixement". Conselleria d'Educació, Cultura i Esport. 2011. Retrieved 9 April 2015. ^ "Knowledge and Social Use of Valencian". Conselleria d'Educació, Cultura i Esport. 2010. Retrieved 9 April 2015. ^ "Ley de Creación de la Entidad Pública Radiotelevisión Valenciana" (PDF). UGT RTTV. 1984. Archived from the original (PDF) on 5 December 2013. Retrieved 9 April 2015. ^ "Los escándalos de Canal 9". vertele.com. 2013. Retrieved 9 April 2015. ^ "Sanz, destituït de secretari general de RTVV per assetjament sexual". Vilaweb. 2010. Retrieved 9 April 2015. ^ "El fracaso de Fabra acaba con el PP". El País. 2013. Retrieved 9 April 2015. 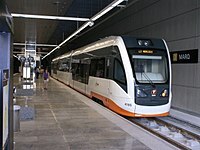 ^ "Polic evict staff in Spain after closure of station". BBC. 2013. Retrieved 9 April 2015. ^ "El coste del cierre de RTVV asciende a 144,1 millones". Levante-EMV. 2014. Retrieved 9 April 2015. ^ See usage of Senyera by political parties EUPV, Bloc Nacionalista Valencià, Green Parties, amongst others, whose combined participation in the Autonomous Elections of 2007 achieved 9% of the total votes.